The Boys’ Brigade joined forces with four youth organisations as part of the Young People Take the Lead (YPTtL) project. 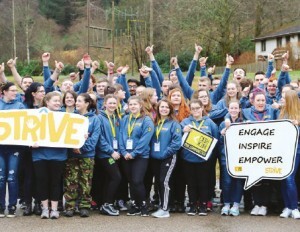 Seventy young leaders from Girlguiding Scotland, Girls’ Brigade Scotland, Scouts Scotland, Youth Scotland and the BB took part in the ‘Strive 2’ residential programme which was led and delivered by young people at the Lochgoilhead National Activity Centre in Argyll. The event and wider project has been made possible thanks to CashBack for Communities funding. Over the past three years many Companies from across Scotland have benefitted from the Cashback for Communities Small Grant Scheme and also the Young People Taking the Lead project. The three-year funding came to an end in March and we are very grateful for the impact that money, seized from procceds of crime, has made to the BB community. We have now moved into the next phase of CashBack funding, however the target has a narrower focus than its predecessor. The target group will be young people disadvantaged by living is areas of deprivation, measured by the top 20% deprived areas in each local authority in Scotland. The funding has allowed the BB to employ a Development Officer to look at starting new provision for the 10+ age range and with the aid of additional funding to help them grow. As a result, existing Development Officer Jackie Wilson will fulfil this role for the BB. The Boys’ Brigade is part of a consortium with Scouts, Girlguiding and Youth Scotland to deliver this work. Help with leadership training opportunities and events for young people from within the target group will also be considered. This new funding is very much in its infancy but we look forward to helping make a difference for young people who would not have the opportunities that many of our Companies have.